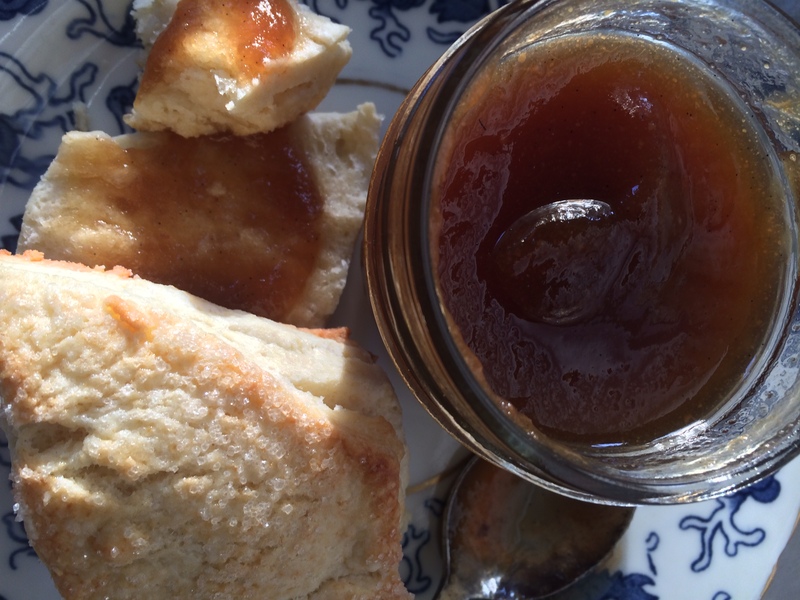 I did not grow up with apple butter on the table. My grandparent’s families were not of old pioneer stock but rather immigrants to Canada in the early twentieth century and as such, they settled in an urban area where they didn’t have access to large quantities of apples from which to make apple butter. But it has been made by colonists in North America for hundreds of years. And now, because of a new interest in canning and preserving, there are many small batch recipes available. I’ve been on a preserving binge this fall, so I decided to make my own fruit butter, how hard could it be? Actually, not very hard at all, BUT, it does require time. I wanted to make the Salted Caramel Pear Butter in The Canning Kitchen by Amy Bronee, sounds delicious right? I’ve eaten lots of fruit butters, mainly apple, and they’re meant to be thick and to be spread, but after the required time (just 100 minutes) the pear butter wasn’t a butter at all, but a sauce. I then pulled down an old favorite, Elizabeth Baird’s Apples, Peaches & Pears, there is a recipe for Honey pear Butter with Rum. At this point I had a pan full of pear sauce, I combined elements of both recipes, increased the cooking time, (total cooking time 4 hours) and produced a thick, sweet and intense pear-flavoured fruit butter. Perfect for scones,pancakes, waffles and yogurt. Wash the pears, remove the stems and cores. Chop coarsely but evenly. Place in a heavy-bottomed sauce pan, crush with a potato masher and bring to a boil over high heat. Lower the heat to medium, and continue to cook for 15 minutes, stirring frequently. Puree the fruit using an immersion blender or a food mill, Stir in lemon juice, brown sugar and salt. Cook over low heat, stirring often until thick and reduced, this will take at least two to three hours and the butter will reduce quite a bit, this also help to intensify the fruit flavour. Once thick, add the rum, and cook for another 10 to 15 minutes. Ladle into clean, hot jars. Seal and process for 15 minutes at a full boil.